When you’re in a state of health where standing is out of the option, simple things, like taking a shower, cannot be taken for granted. While there are many devices that can help you with this, Healthline’s EZee Life Tilting Rehab Shower Commode Chair, in particular, does the job better than others. Its structural design was developed with the entire human body and its movements in mind - from the top of your head to the very tips of your toes. With 4 height settings, this shower commode wheelchair can adjust to anyone utilizing it. But its functionality goes beyond simply accommodating to a user’s height; its multiple height settings also allow the user to roll over a commode, between 19-22 inches, with ease and comfort. Oftentimes, transferring patients over to the toilet is a tough job and can be a frustrating process, but it doesn’t have to be that way. The EZee Life height adjustable shower commode chair offers the patient independence, convenience and privacy, due to its 24” self-propelling rear wheels with quick-release axles. 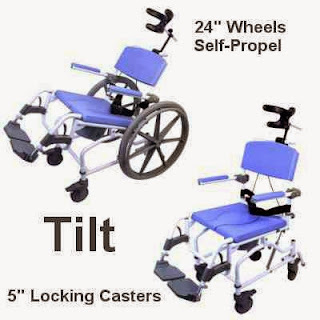 These rear wheels can easily be switched out with the chair’s original 5” locking casters, providing the freedom and option to propel with an attendant or on one’s own. It’s safe to say that a seated, upright position is not the best posture to get a thorough clean, and there are probably a lot of potential areas to be missed. A tilt-in space shower chair, like the Healthline Tilting Shower Chair, allows you to clean harder to reach areas. It has a tilt range of 0-20 degrees for the posterior and 0-10 degrees for the anterior. For extra comfort, the seat itself is padded with a removable key-insert for easy showering and toileting. The padded seat is also sealed to prevent moisture from getting in and an opportunity for mold to grow. Now you’ll really see what we mean when we say that this shower chair pays mind to your body, from head-to-toe. Headrest – The headrest is adjustable in more ways than one. It can move up, down, forward and back. Armrests – These armrests flip back for more convenient transfers and accessibility to the patient. Footrests – These footrests adjust to your height and flip-up or swingaway when you want them gone entirely. Make your comfort and independence a priority with the EZee Life Tilting Rehab Shower Chair by Healthline, and visit PHC-Online to view other great home medical equipment needs.